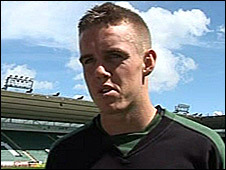 Plymouth Argyle have completed the signing of left-winger Craig Noone from Blue Square North side Southport. The 20-year-old has signed a two-year deal at Home Park after the two clubs agreed an undisclosed fee, which could rise to in excess of £100,000. Liverpudlian Noone had only been at Southport for a few weeks after moving from Burscough over the summer. He told the club website: "It's the move of a lifetime. It's just sinking in now that I'm going to be full time." Argyle boss Paul Sturrock added: "I am very excited by this signing. Craig comes to us with a glowing reputation. It is now up to him to prove that it is merited. "He has an opportunity to impress me and force his way into my thinking. Whether he takes that is up to him. "I see him as one for the future, but if he shows me he can make the step up to the Championship the door is open for him."